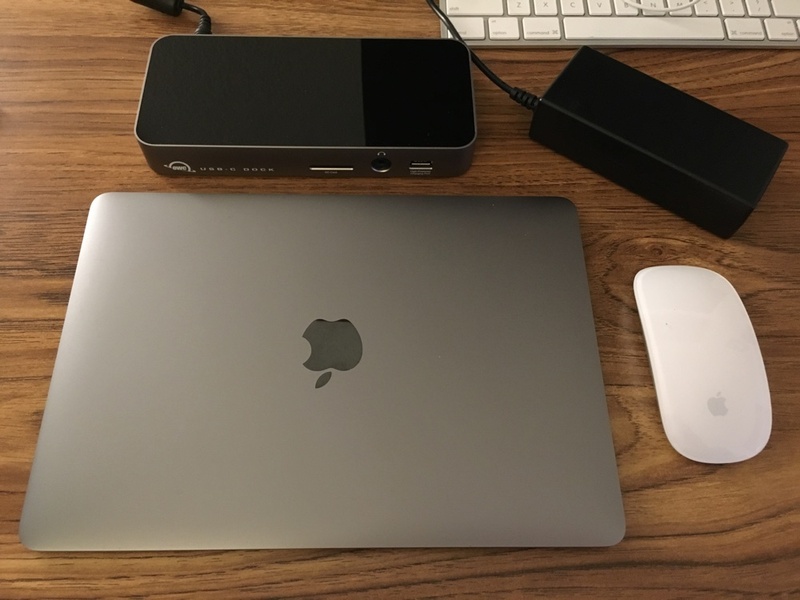 There are now unpowered USB-C hubs and docks that are small and lightweight, designed for travel with a MacBook. They have extra USB-A ports, perhaps a VGA port for overhead presentations and maybe USB-C power pass through. Because they're small and light, there's likely not much more. However, there is a real need for a full-featured dock that has many more kinds of ports: high-power USB-A ports for charging iDevices, Ethernet, HDMI video, and audio. This OWC dock has all that and electrical power to spare. 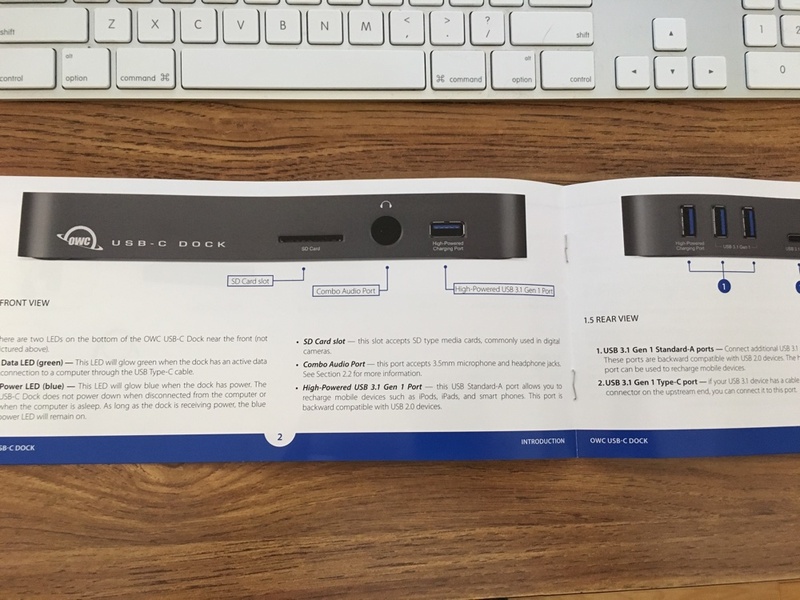 The most important thing to know about the Other World Computing USB-C Dock is that it is fairly large (specs below) and has a companion power brick that's also fairly large. But it is also conservatively engineered to have plenty of power with a safe margin. As a result, it may well be preferable keep this dock on a desk where the MacBook resides at home or in the office. And then, for travel, one could use one of the smaller hubs such as the ones from Satechi or Minix. Of course, with pass-through power on those devices, one will need the original charger brick that comes with the MacBook. On my desk, showing relative size of power brick. 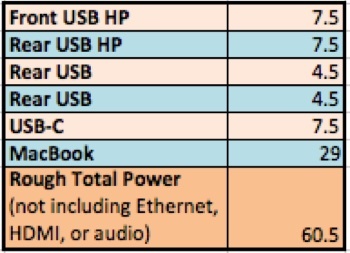 Note #1: USB 3.1 Gen 1 is actually USB 3.0 @ 5 Gbps, as opposed to USB 3.1 Gen 2 which is 10 Gbps. The design is commensurate with the capability of the MacBook itself. Note #2. There is plenty of power available for pass through to the MacBook and the two high-power USB-A ports. I was particularly curious about the power and size engineering trade-off, and OWC provided great detail. The main difference here is that our USB-C Dock has USB power delivery, meaning it can charge the MacBook.... We have three USB ports (two Standard-A high-power and a Type-C that has the same power as the high-powered ports) and amplified audio in/out. The addition of power delivery, three high-powered ports, and amplified audio-in/out means more space is needed on the printed circuit board (PCB) compared to [other devices.] So, the size of the USB-C dock really is as compact as it can be, to be able to deliver the power and connectivity benefits it does. Note #3. The Ethernet port is quasi-functional out of the box and requires the installation of a kernel extension (kext) for full functionality. OWC explains. 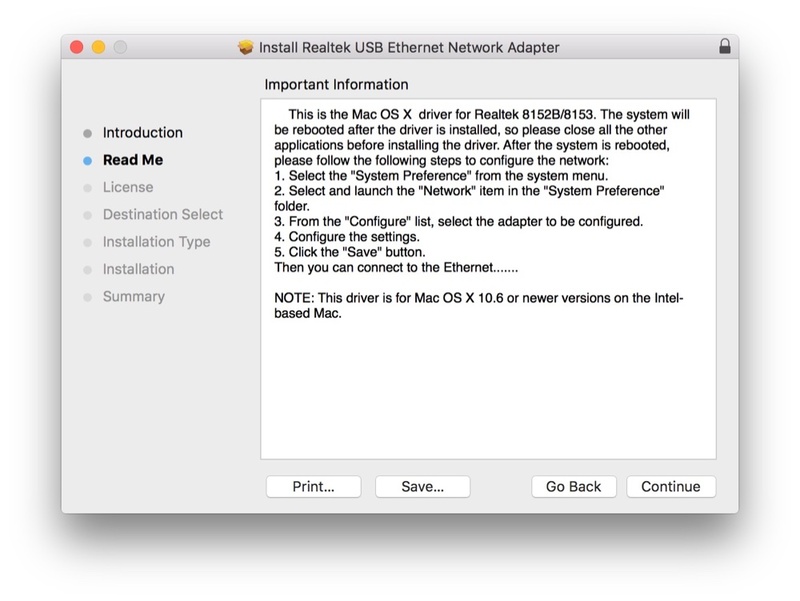 Without the driver installed, Ethernet will function if you connect the USB-C to the MacBook after it is booted. However, if you put the MacBook to sleep, or have the USB-C Dock connected to the MacBook before the MacBook is turned on, the Ethernet will not function. Having the driver installed corrects this. This is not so bad. I have another USB-C dock for review that has an Ethernet port. That port won't function at all unless the developer's driver is installed on the Mac. I want to point our how very pleased I was do discover that after I downloaded the Ethernet driver, the folder [RTUNICv1.0.11] contained both an installer and an uninstaller. (An admin password, not root, is sufficient.) This is a testament to OWC's thoughtfulness and respect for the customer. One doesn't see that with many developers. The uninstaller script is a double-clickable .command file, just like the one I described in: "OS X: How to Convert a Terminal Command Into a Double-Clickable Desktop File." The HDMI port supports up to 4K video output without any impact on the other ports. 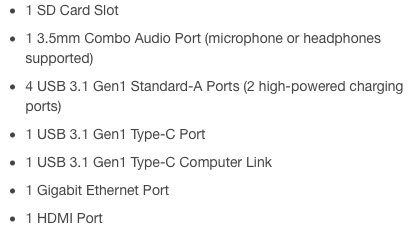 In addition to pass through power to the MacBook, note from the list above that there is a second USB-C port for direct connect to, say, USB-C drives. The glamor shot: no cables. As with every product from Other World Computing, the packaging, supporting cables, and documentation are first class. This is reflected in the price, and as a result, the presentation, quality and developer support are in sync with the product's price—just as we see with Apple. I tested every port except the HDMI port. They all worked perfectly out of the box except for the SD card slot. The first time two times, my SD card didn't mount. Thereafter it did. I brought this up with OWC, and we've yet to arrive at a diagnosis. After the initial attempts, I've had no problems. This port supports SD, SDHC, SDXC up to 2 TB in size and up to 40 MB/s in speed. This device isn't just a box with ports. It's virtually a work of art. It has the mirrored black top like the OWC Thunderbolt dock. Each port is clearly labeled. The aluminum finish (in space gray, silver or gold) and ports have great fit-and-finish. Like the MacBook in front of it, it's a pleasure to handle and look at. While it may not seem important to some, it's nice to have a couple of 1.5 amp ports handy to charge up an iPad even if the MacBook is somewhere else. Just note that if you don't elect to sync your iDevice to your MacBook, have the MacBook unplugged first. I have a very accurate scientific scale, and it reports a weight of 458 grams (1.01 pound), not 0.9 pounds as listed on the spec page. Also, if you're curious, the power brick, with its non-removable dock-side cord weighs 391 grams (13.79 ounces). (The power outlet-side cord is removable.) And so a travel bundle would be just about 0.9 kilos (2 pounds). The dock itself is 2.8 cm (1.1 inches) high x 9.0 cm (3.5 inches) wide x 20.0 cm (7.9 inches) long. See the photo above. There are generous rubber feet on the bottom. Like the hard disks I've purchased from OWC, the box is nicely designed so as to protect the dock when shipped. The mirrored top of the dock is protected by a sheet of plastic that removes without fuss. The serial number is on a sticker both on the box and on the dock. Included for testing, but a $15 option, was a 18-inch (45 cm) USB-C to USB-C cable for pass through charging of the MacBook. This one was long enough to wrap around to the MacBook but not so long as to require a zip tie. OWC also offers longer cables if needed at purchase/checkout. The manual is an oversize pamphlet, 10 inches wide (25 cm) and is six pages. Each port is numbered and called out with an explanation. There is a whole page dedicated to troubleshooting and ways to contact OWC technical support by phone, email or chat. Excellent, easy to read manual. The warranty is two years, not the customary one year. This is impressive and reflects the quality of the product and the corresponding confidence OWC has in it. No product is perfect. I had several gripes. It was hard for me to decide which way to orient the dock. The glamor shots obfuscate this decision a little bit. If the side with all the ports faces you, then the power cord has to wrap around from the back to the front. If you have the side with the power port facing back, precious few ports are front-facing with only one high-powered USB-A port there. The USB-C port allocated to the MacBook has to wrap around to the front. I can imagine how a different placement of ports could be more optimal and simplify the cabling. Except for the Ethernet activity lights (visible inside the port above), the master Data LED (green) and power LED (blue) are on the bottom where, of course, they can't be observed unless the dock is lifted up. This is just like OWC's Thunderbolt Dock, and it's just plain crazy. Even though OWC says they're there only for troubleshooting, I prefer my LED indicator lights always visible. Finally, when I was installing the Ethernet software that I downloaded, an installer phase came up that said, "Read License," "Disagree," or "Agree." When I clicked on "Read License," nothing happened. However, if I clicked on "Agree," installation proceeded. Installer is straightforward except for note above. 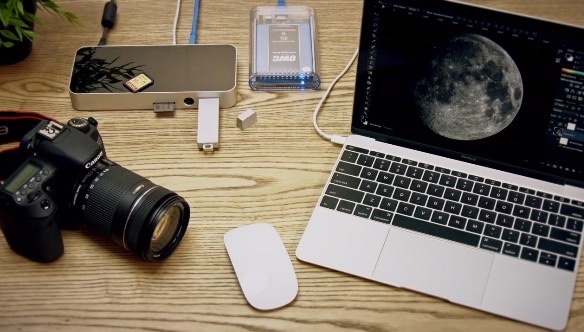 If you have an Apple MacBook and have great ambitions for it, including a second display, external hard disks for backup, lots of ports for Flash drives and even an amplified audio-jack, then this is a great complementary product. While I don't think many would travel with this dock, that's just my estimation. It depends on how one travels. And that's why there are competing products to chose from, as needs vary. However, if you're looking for an excellent USB-C dock with all the desirable ports, plan to use it on the desktop where a power brick can be stashed underneath, and you want first-class quality, this is a terrific product. Note #4. Previous pre-orders shipped in February, 2016. New orders will ship in mid-March. Fully powered with engineering safe margin, ten ports, two high power USB-A ports for charging, status lights, Ethernet (with some restrictions) out of the box, HDMI suppports 4K, amplified audio out, available in three colors to match the MacBook, two year warranty, excellent manual, uninstaller script included for Ethernet kernel extension (that provides full functionality), beautifully designed, great fit-and-finish. 14 ounce (391 g) power brick required, status lights hidden on bottom, front-rear placement of some ports slightly awkward.